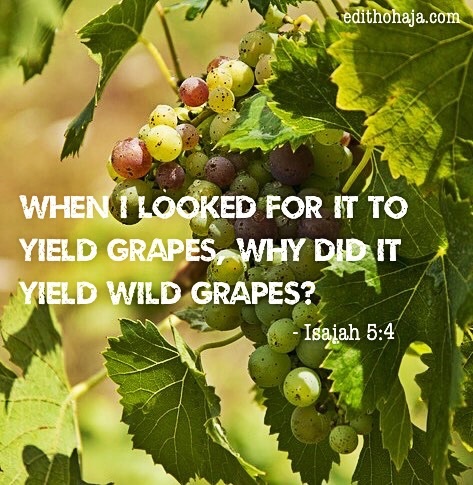 Today, I read that interesting passage in the book of Isaiah on the song of the vineyard. Recently, in researching a story I’m writing, I’ve also had to check up some stuff on vineyards in France. Thinking about it all, I was led to share the following with you. You know of course that through Christ, we are the Israel of today, Abraham’s seed, God’s chosen people as the Scriptures declare. “Let me sing for my beloved my love song concerning his vineyard: My beloved had a vineyard on a very fertile hill. “He dug it and cleared it of stones, and planted it with choice vines; he built a watchtower in the midst of it, and hewed out a wine vat in it; and he looked for it to yield grapes, but it yielded wild grapes. “And now, O inhabitants of Jerusalem and men of Judah, judge between me and my vineyard. “What more was there to do for my vineyard, that I have not done in it? When I looked for it to yield grapes, why did it yield wild grapes? “And now I will tell you what I will do to my vineyard. I will remove its hedge, and it shall be devoured; I will break down its wall, and it shall be trampled down. “I will make it a waste; it shall not be pruned or hoed, and briers and thorns shall grow up; I will also command the clouds that they rain no rain upon it. 1. The owner loved his vineyard very much. Similarly, God’s love for us is unquestionable. He created us from the dust of the earth and gave us life. 3. The owner expected the vineyard to yield the right fruit to justify his investment in it. God too demands the fruit of righteousness from us. 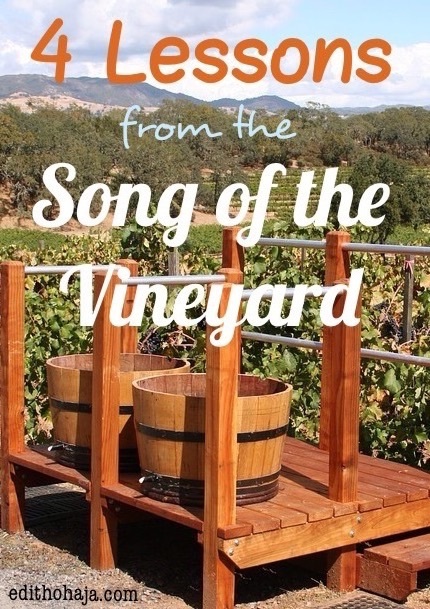 Do you notice that the vineyard in the song wasn’t barren? It was bearing fruit alright, but they were wild grapes. The owner complained that they weren’t the kind of fruit he wanted after planting very good seed and providing the proper conditions for his vineyard. We cannot live however we wish after all that God has done for us. Some people keep saying we are all sinners and God understands. That was the whole point of sending Jesus. To walk in our shoes, pay the debt of our sins and empower us to live above them. If we cannot overcome sin, then Christ died in vain. We may fail occasionally because we are still moving towards perfection but to live a lifestyle of sin and to be comfortable in it negates our profession of faith. “Giving thanks to the Father, who has qualified you to share in the inheritance of the saints in light. “He has delivered us from the domain of darkness and transferred us to the kingdom of his beloved Son” – Colossians 1:12-13. “What shall we say then? Are we to continue in sin that grace may abound? “By no means! How can we who died to sin still live in it? “Do you not know that all of us who have been baptized into Christ Jesus were baptized into his death? If we have accepted Jesus as our Lord and Saviour, we are no longer helpless before sin. We can resist it by the power at work within us. The choice is ours to make as some other verses from the same chapter of Romans show. “Let not sin therefore reign in your mortal body, to make you obey its passions. “Do not present your members to sin as instruments for unrighteousness, but present yourselves to God as those who have been brought from death to life, and your members to God as instruments for righteousness. As to what constitutes sin, we don’t pick and choose according to our whims or let society and the prevailing culture dictate to us. We follow the standards already spelt out in the word of God. 4. The vineyard owner threatened to destroy it for yielding the wrong fruit. There are dire consequences for us too if we persist in walking contrary to God’s plan and directives. “Everyone then who hears these words of mine and does them will be like a wise man who built his house on the rock. “And the rain fell, and the floods came, and the winds blew and beat on that house, but it did not fall, because it had been founded on the rock. “And everyone who hears these words of mine and does not do them will be like a foolish man who built his house on the sand. So, on what are you building? If you take the Lord for granted and make mockery of His standards, you are building on sand. But if you cherish His word and listen to His Spirit, you are building on the rock. Receive the grace to do the latter today in Jesus’ name. The scriptures in this post are from the English Standard Version of the Holy Bible. This article is beautiful, and amazing.......... the way you have gleamed from the Holy WORD and your research to bring it all together in magnified wisdom. Thank you. Praise God and thanks a whole lot, Tammy! My prayer is that blesses many. Have a beautiful week in Jesus' name. Just as a parent who has provided a child with everything in order to have a successful education expects dat d child perform excellently, so has God given us everything and expects only one thing from us, which is holiness. This piece is indeed a reminder dat we are God's vineyard and for dat we are expected to produce gud fruits in line with d Word of God. 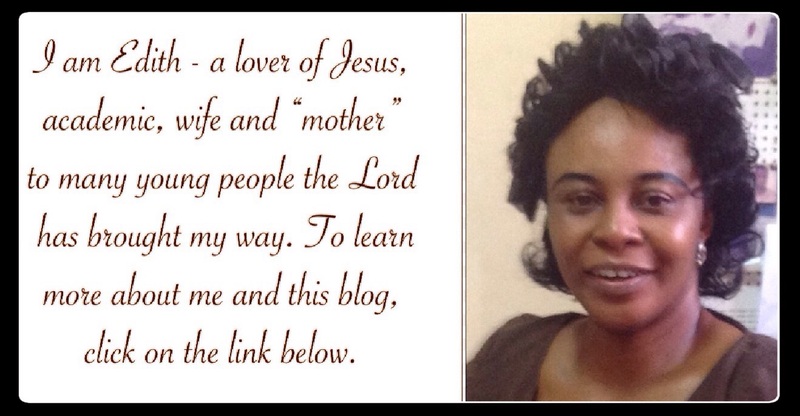 God bless u, ma, and empower u to continue to touch lives. Thank for your wonderful comment and prayer. I say a big "Amen" to it in Jesus' name. Edith, if you will accept, I nominate you for a blogger recognition award, as discussed in my latest blog post, because your blog is fun, creative and full of grace (as you said). I really appreciate, Tammy, and have replied through Facebook Messenger. Have a grace-filled August in Jesus' name. I concur. Amen in Jesus' name. when you're in love, you just like giving your all and it being misused is the most painful way to die easily as its not reciprocated. but not so with God as he can be as patient as ever and he gives multiple chances for us to come back to him. This piece is amazing. God really loves us and has proven his love several times. We, therefore, need to obey and honour his words when pronounced. Thanks ma! This is an amazing article, the vineyard represents us as humans and what God's expectations from us are. So we should at all times pay close attention to the demands of God over our lives in other to yield the desired fruits. This widened my understanding about this passage, I'm proud to be a Christian... I love God and he loves me. I pray for his mercy on those who sin against Him.. "God’s love for us is unquestionable"
This song of the vineyard is a road map for all Christians to follow so that we would not be destroyed by God just like the vineyard was destroyed by its owner because it yield the wrong fruit. We need to live a righteous life by emulating from Christ Jesus the way he followed in obedience to the call and will of God. The central theme I was able to take note of is that it’s not about bearing fruits but about bearing good fruits which God wants us to bear. God wants us to bear fruits of obedience, love, kindness, faithfulness, hope, trust etc. but sometimes we end up bearing bad fruits which God describes as wild vine. These bad fruits can be hatred, wickedness, lack of faith and so many others. And according to the passage, when we bear wild grapes instead of good ones, God will take his eyes away from us. He will take away his protection, love, guidance, and grace from us and allow the enemy to manipulate us and trample upon us. When God leaves us, we become vulnerable to the plans of the wicked and so many bad things begin to happen to us. But when we bear good fruits, God will take good care of us like he did to the vineyard. His banner over us is love, human beings are special creatures of God. He lives in us all. We are his vineyard, he always expects us to please him and to make him happy. Sin is the only things that distract and obstruct us from God’s love. Therefore my dear brothers and sisters let us walk in God’s way and his blessings will forever be ours, AMEN.